Yesterday we brought you this image of the first new GTI destroyed in a crash. It happened to Cars.co.za editor Ciro De Siena. Here's the story, straight from Ciro, of what happened — Ed. The GTI launch was pretty much a standard issue car launch; pair up with a driver and hit the road. The accident happened after lunch. It was in a grape growing region of the Western Cape, very rural but great roads and great visibility. We weren't pushing too hard, genuinely around the speed limit of 120km/h. The bakkie (pick-up) was way ahead of us and crawling, if not stationary, on the left hand side of the road. My driver had a perfectly clear road ahead to overtake, and moved to the right to pass. Closing on him with I'd say less than 80m to go, he just U-turns. No indicator. We didn't stand a chance. My driver moved further right to get around the front of the bakkie, but our options very rapidly narrowed to either running into a big ditch or hitting the vehicle. If we were on anchors for 20m it was a lot. And then the impact. It's quite possibly the most awful feeling imaginable. My mind was fairly calm but my body panicked, and for a moment I felt an awful horror: this was going to be a big one, and I was going to get hurt. Properly hurt. It shakes up a very primitive part of your brain. A very loud series of noises followed, and everything was very white. I was totally winded and in quite a bit of pain. The driver asked me if I was okay, I replied yes and he immediately climbed out to go help the other driver. The sweeper car pulled up and so did the medics. Amazing efficiency and professionalism from everyone at VW. The seatbelt pre-tensioner worked perfectly. It exploded into place and prevented me from moving around to much. The airbag hit me, but not very hard. This was either because of the seatbelt, or the force of the crash throwing me more sideways than forward. But your head is a very heavy object, and the Gs have a lot of opportunity to swing it around. I'm really stiff now all the way down my back. As soon as I saw the bakkie driver pop out of his side window like a meerkat, chatting on his cellphone, I knew everyone was okay. I wiggled my fingers and toes and my immediate thought was, "I'm fine, but this is going to hurt tomorrow". And I am fine. My neck's a bit sore, I've got some bruising on my collarbone from the seatbelt and my shin took a little knock. But that's about it. I pretty much hopped out of a horrendous accident, where my side of the car took the majority of the impact. Every single safety system worked perfectly, and I am so happy I was in a modern car of that caliber. This was an accident in the true sense of the word. It was awful for everyone involved; no one wants this. But we have to get around and we have to drive something. And that incredible piece of engineering is what kept me out of hospital today. I've been at this car journo gig a long time. We write endlessly about the features of the cars we drive, but some of them we never, ever want to test. Today we tested those features. And they are phenomenal. The journalist in me kicked in quickly, and once I knew everyone was okay I thought, what a story, what images, and I began tweeting away. This is a story that needs to be told, these are images that I hope will remind everyone who ever uses a road that accidents do happen, and to please be very careful. All the best, and I remain a huge fan of Jalopnik. Have just ordered a large G&T. It's medicinal. 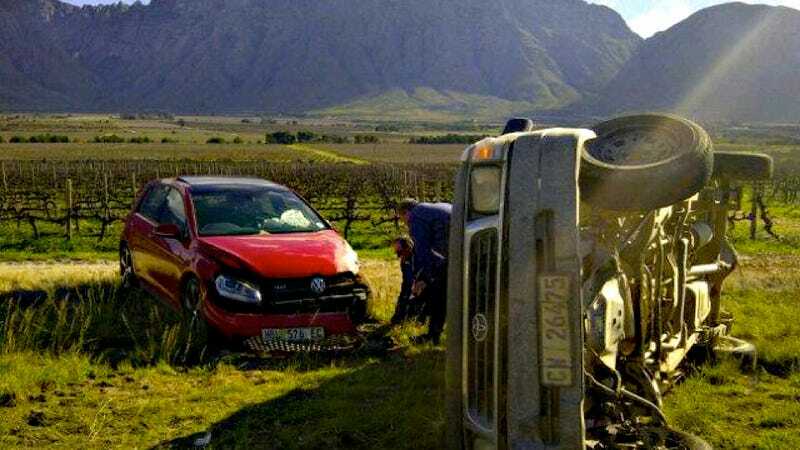 Ciro De Siena is the editor of Cars.co.za, one of South Africa's leading car sites, and he nicely shared this story with us after we posted the tweet of his accident. More details and photos over at his website, which you should check out. — Ed.